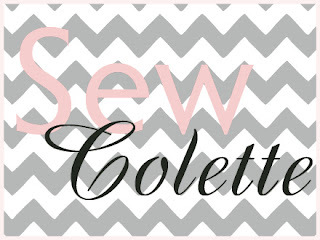 Sew Colette - Guest post! Hi everyone! Meg the Grand (love her) was sweet enough to do a guest post for Sew Colette. She sewed up the Taffy earlier this year and was willing to do a write up on her sewing experience. I remember seeing her Taffy and being in awe of her color choice and cool modifications. Thanks for sharing with us, Meg!!! Friends, I love this pattern. L.O.V.E. Pair it with jeans and you've got the perfect outfit for a night on the town; pair it with a pencil skirt and watch your coworkers turn green with jealousy. I, for one, chose to finally tackle this pattern because I had the perfect fabric for it. I used some large scraps of polyester in my stash in order to create this blouse. While the handbook instructs you to cut your pieces on the bias, I knew that I wanted the sheer stripes running vertically on the blouse and cut the pieces out on the grain line instead. This ended up working out in my favor as the polyester had a bit of stretch to it, giving me the wiggle room that a bias cut blouse would have allowed. This polyester was a bit thicker than most of the polys I've worked with in the past, so I ended up using a thicker needle for this project. Because of the thickness of the fabric, my French seams did come out a little wonky and uneven on the inside of the garment. I have never created anything using French seams before, and the book is SPOT ON with their directions. I've gotten so confident in my French seaming that I use this finishing technique as often as possible. The body of the shirt went together very quickly. I spent the majority of my time for this project on the hand sewing. Because I didn't want to take away from the sheer portions of the shirt with my messy polyester v. sewing machine battle, I used a blind hem hand stitch to attach all of the bias trim. To be honest, I cheated a bit on the bias trim. I cut long strips of the fabric on the grain (since I was working with large scraps originally) and since the fabric had a bit of stretch to it, it ended up working just as well. The main issue, besides the large hems on the sleeves, was the fact that all of my brand new hand sewing needles were having difficulty piercing through the polyester. My fingers were hurting quite a bit by the end, but it turned out to be the perfect time to play the "Sweetie, I think I might need a hand massage" card. 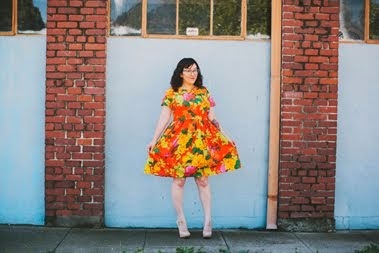 If I had to offer any tips on sewing up this pattern, I would say that this is a really fantastic pattern for showing off those VIP fabrics in your stash - it allows your fabric to take center stage and shine! The lack of bodice detail (aside from darts) means that prints and stripes and florals can be seen in their full glory. The sleeves allow for the fabric to be altered from the bodice view - try having stripes run horizontally along the middle of the outside of the sleeve, or see how many flowers in your floral print you can line up under the pattern piece. I was completely pleased with how my Taffy turned out and I've been brainstorming other versions to make with some of the more wild/sheer fabrics in my stash. I have some pink and black silk that I think would be fantastic as a Taffy for this summer (with black bias trim, of course). I'm excited to see all of the versions of this pattern that this Sew Along group is making! Good luck and have fun with the French seams (they are the BEST)! I love your Taffy, Meg! Thanks for guest posting!